What is the Commission recommending? The European Commission has presented a set of actions to improve cooperation between multilateral and national development actors and to make the European financial architecture, including its governance, stronger and more efficient, while maintaining diversity in the market. By providing stronger policy steer, the Commission wants to make sure that public resources are well spent and that the EU is equipped to deliver its external investment policy goals and meet the ambition of the newly proposed Neighbourhood, Development and International Cooperation Instrument in the next budgetary period. Why do we need a better architecture for investment outside the EU? The EU needs to respond to increasingly complex challenges in the world, ranging from conflicts and migration to climate and demographic change. To address these, development finance needs to be as efficient as possible, using a combination of funding sources – both public and private. Resources are currently not always deployed in the most effective way. External investment supported by the Union should aim to finance sustainable development in our partner countries. At the same time, they have to serve the long-term interest of both the recipient partner and the EU, promoting an enduring and deep economic relationship between the two. It is important to ensure that projects are not only driven by short-term considerations but provide long-term strategic value for the partner country and the EU. 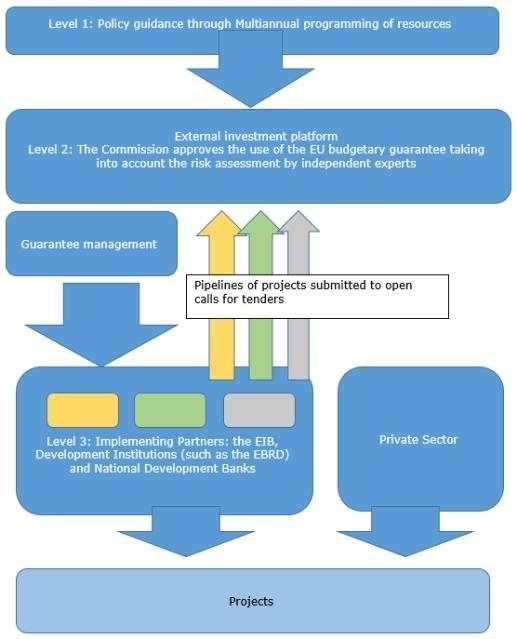 Investment decisions should be made in a more coordinated way: at the moment, the European Investment Bank (EIB), as the EU's bank, the European Bank for Reconstruction and Development (EBRD) and national and regional development actors mostly carry out their activities independently of each other which in turn weakens the EU's ability to pursue its external policy objectives. One way to increase coherence would be to set up an external investment platform under the next Multiannual Financial Framework (MFF), bringing together all existing EU budget external investment instruments under a single platform. How would the new single platform for external investment work? The Commission and Member States would set the sectoral and geographical priorities, with independent experts carrying out risk assessments of programmes and projects. The EIB, the EU's partner in investment, and other development finance institutions would have access to the EU guarantee to deliver the highest added value on the ground. The Commission would be responsible for the policy compliance check of the projects and the overall management of the use of the EU guarantee, but would not carry out any banking operations. The European Commission has no intention to act as a development bank but will continue to use its resources and expertise to steer the EU's external policy direction, working closely with Member States. Who would choose the projects for the EU guarantee? The Commission would identify the best projects in consultation with Member States. The projects would then be risk assessed by a group of independent experts. These experts could be selected as a result of a tender with the private sector and work as external consultants, or they could be seconded from the EU's and national development institutions. The Commission would be responsible for the policy compliance check of the projects as well as the management of the use of the EU guarantee. What type of projects or companies should the EU finance outside the EU? The EU should continue to finance projects and companies in strategically-important sectors outside the EU, such as energy and connectivity, digital, environmental protection, as well as providing access to finance to small companies, creating job opportunities notably for young people. A recent example of a guarantee programme approved for financing under the External Investment Plan is the NASIRA Risk-Sharing Facility. With an EU contribution of €75 million, it is expected to generate a total investment of up to €1 billion in Sub-Saharan Africa for projects by small and medium enterprises. Led by the Dutch development bank, it will benefit under-served entrepreneurs who currently have difficulty borrowing money at affordable rates, such as internally displaced people, refugees, returnees, women or young people. What's the advantage of allowing other institutions to access the EU budget guarantee? Allowing other institutions – in addition to the EIB – direct access to the EU budget guarantee will allow more development actors with relevant expertise on the ground in a particular sector or geographical area to benefit from the guarantee in order to finance a project. Being the EU Bank, the EIB would continue to play a key role as implementer of the guarantee. What are the investment needs in Africa and the wider developing world? The funding gap for small and medium-sized enterprises (SMEs) in Sub-Saharan Africa – which is responsible for the large majority of jobs on the continent – is estimated to be around €125 - €150 billion per year. In climate change adaptation, costs are estimated to range between €18 and 27 billion per year over the next 10 to 20 years. In the energy sector, investment needs are estimated at around €35 billion per year. More investment is also required in agriculture and rural infrastructure, transport, social infrastructure, education, the digital agenda, and water and sanitation. What are the latest results and next steps of the External Investment Plan (EIP)? Less than a year after the EIP's official launch, the EU is on the right track towards achieving its commitment to leverage €44 billion of public and private investment in sustainable development with an input of €4.1 billion from the EU. With matching contributions from EU Member States and other sources, the External Investment Plan could double the investment figure to €88 billion. On 10 July, the EU took a milestone decision to allocate €800 million from the Guarantee of the European Fund for Sustainable Development for a package of investment programmes. This is expected to leverage €8-9 billion of public and private investment. The programmes will cover investment in several areas: financing for small businesses, including ones involved in agriculture; sustainable cities; sustainable energy and connectivity; and access to the internet and digital services. This adds to the €1.6 billion that were mobilised for blending operations (i.e. the mixing of public grants and loans), which will mobilise up to €14.6 billion. So in total, the EIP is set to trigger over €22 billion public and private investment so far. This will support much needed investment in sustainable development and decent job creation, particularly in Africa. When do you expect the ‘Neighbourhood, Development and International Cooperation Instrument' to be agreed by Council and Parliament? Negotiations between Member States and the European Parliament on the Commission's proposal for a Neighbourhood, Development and International Cooperation Instrument under the next MFF have started. The European Commission has consistently called for a swift agreement on the long-term EU budget and its sectoral proposals in order to ensure that EU funds deliver results on the ground as soon as possible. This is of the essence if the EU is serious about promoting stability and sustainable development in Europe's Neighbourhood and the world. Communication: "Towards a more efficient financial architecture for investment outside the European Union"
Communication: "A new Africa-Europe Alliance for Sustainable Investment and Jobs"